An outdoor deck provides additional living space, creating a living or dining area for you to enjoy during nice weather. A variety of materials are needed for your deck, and with so many options available, it is recommended that you consider your home's design and outdoor space as you plan your new deck. Once you've selected the style of your new 12 feet-by-16 feet deck, it is important to select the proper type and quantity of all materials. Purchasing in advance will prevent construction delays, avoiding interruptions while you wait for items to be delivered. To measure out your deck and determine your footings, you will need batterboards and mason's string. A standard deck will need four footings parallel to the house, but they will need to be temporarily braced by 6 inch-by-6 inch posts. Using doubled boards, you will then need to build beams on the top row of the posts to frame the edges of the deck. These must be topped with adjustable post caps. Also needed are joist hangers and blocking pieces that are placed between the joists. As part of the initial framework when building your deck, you will need to purchase concrete to secure your footings in their holes. To determine the amount needed, you will be required to do some basic math. First, measure the hole in inches, then multiply half of the diameter times itself. Next, multiply that number by 3.14. That answer will be multiplied by the depth of the hole, again in inches. Finally, divide your answer by 1,278, which equals one cubic foot. This final number will be the amount of cubic concrete needed to fill the hole. You will need to use a 60-pound bag of concrete to make half a cubic foot. Once you've determined the amount of concrete needed, divide it by 0.5 to determine the number of bags you'll need. Alternatively, you can ask the concrete supplier to deliver ready-mixed concrete using the total amount cubic feet you've calculated. For a standard, elevated deck, there are several board options. To calculate the amount of wood you need, multiply the length of the deck surface times the width. Then, account for overhangs and provide yourself with allowance for waste. As a guide, if you choose to use 20-foot boards, you will need to purchase 22 of these boards. Similarly, 18-foot boards will require 24 boards, 16-foot boards will require 27 boards, 14-foot boards will require 31 boards, 12-foot boards will require 37 boards and 10-foot boards will require 44 boards. Each of these options factor in 5 percent waste. The board size and amount necessary may depend on the material you choose. There are a variety of options available, all providing a different look and cost. Your deck can be built with pressure-treated cedar or redwood, ipe or jarrah woods or even composites. Composite materials, such as vinyl, are also an option. Although composite is more expensive to purchase, the costs often pay for themselves over time as it does not need regular maintenance and refinishing, unlike wood. Railings and stairs will require an additional amount of wood. To determine the amount necessary, refer to your drawings to estimate the number of posts, balusters, rails, stair treads and stringers. Before you construct your railings and stairs, confirm your estimate by measuring on-site. As your initial estimate may differ from your on-site measurements, you may need to purchase additional wood. Note that if your deck is below a certain height, which local codes will set at either 18 or 24 inches, or if your stairs run the width of one side of your deck, you will not need to install railings. Your deck must be secured with hardware. 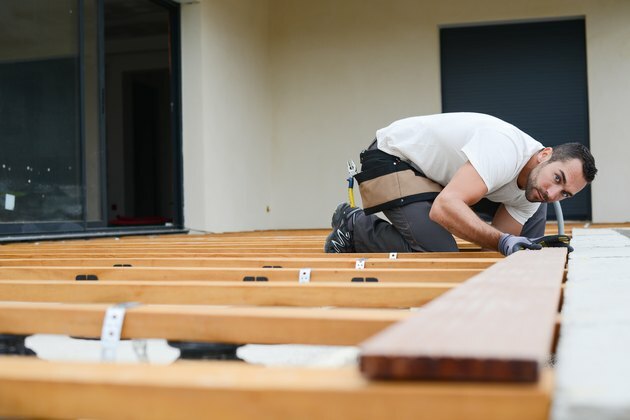 For metal connectors and hardware, count the amount necessary for the framing. To estimate the correct amount of screws or nails, plan to use 5 pounds of screws for every 100 square feet of decking. When purchasing hardware, be aware that purchasing cheap, low quality screws will result in corrosion, which will discolor your deck and shorten its life. Stainless-steel or coated screws, especially those made specifically for pressure-treated wood, are designed to resist corrosion, therefore extending the life of your deck.